A flat roof, though considered purely for commercial properties, is a good alternative to standard residential roofing options like asphalt and metal roofs. And while it’s an aesthetically pleasing choice, it does require extra care. 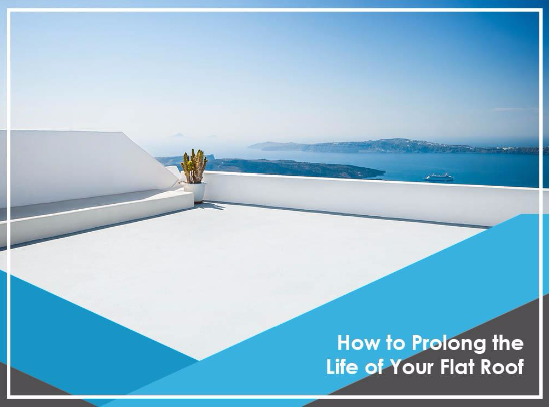 Tedrick’s Roofing discusses how to prolong the life of your flat roof. Because of the lack of slope, flat roofs tend to collect leaves, dirt, and branches on its surface. While they may seem harmless, the branches can scratch the surface, and the rotting leaves may cause premature aging. So, it’s always a good idea to regularly sweep the dirt and debris off the roof, especially if you’re in an area with a lot of trees. The development of a roof leak on your flat roof is dangerous because it means the bitumen roofing has been breached by water. Flat roofs are more susceptible to this because it has no slope, so water remains on its surface instead of pouring off the edges. To prevent this, we recommend sealing your roof with an extra waterproofing coating. Have a professional do this because uneven coating of the sealant can do more harm than good. Finally, make sure you have a professional roofing contractor take care of cracks on the roof surface as soon as possible. Just like leaks, these can grow in just a matter of weeks and will eventually cause more problems when it gets worse. Tedrick’s Roofing offers complete roofing services. We’ll make sure your flat roof stays in good condition throughout the year. Give us a call at (877) 212-9355 for more information on our services. We offer complete roofing services throughout Auburn, WA.